Alas, Mac desktop users are stuck with the reverse problem – serving poutine at Four Seasons – also known as a clunky, bloated Outlook that aims to embarrass the user and make it terribly hard to gain any utility from it. But, this past week, I stumbled upon 3 great Mac calendar apps (2 on the iPhone and one on the desktop) that take the sting away from Outlook (keeping it safely in the background) while surfacing key functionality where needed, when needed. Cos simple’s always better than complex. If Apple had spent sufficient time designing a calendar app this is what they’d have ended up with instead of the underwhelming Mac calendar app. The app looks gorgeous (think Helvetica) but more importantly it reduces the number of clicks to get to important parts of the calendar as well as to visualize your calendar. Plus, it does a neat sync with Exchange. They also have a more robust calendaring 2.0 version (that includes task management) for $2.99 that I wouldn’t recommend. 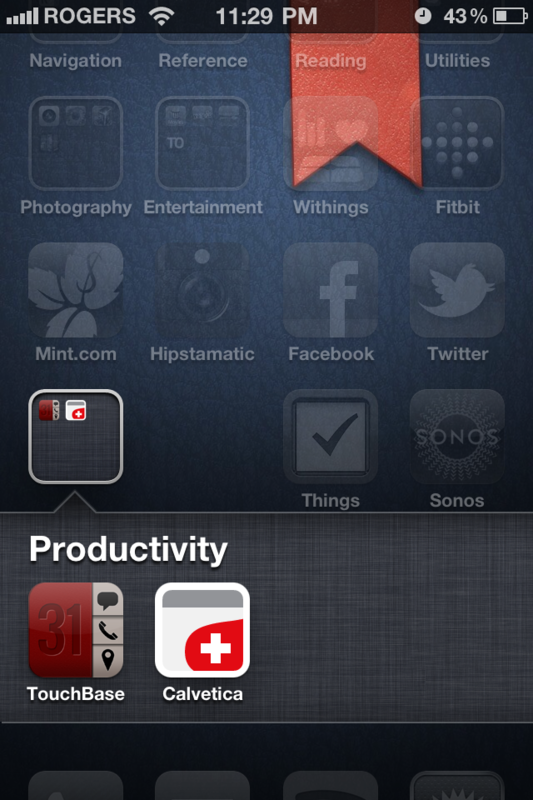 This app tends to look a tad more noisy than the classic version and lacks its minimalist tendencies. When one click is always better than two, or three, or more. Of what use is a calendar app when it takes forever to say, inform your fellow meeting attendees that you’re late for a meeting or to postpone it. Plus, it takes forever to find the address where your meeting’s taking place and I could go on. TouchBase’s strength is the same as Calvetica – great design that surfaces to your finger tips, the most important relevant information around a meeting intelligently. For e.g. First off it creates these simple visually simple cue cards that pull all the relevant information for a meeting (including participant’s contact – phone and email addresses provided your address book has them). The best part of this is the “I’m here late” or “I’m running late by…” tabs that makes sending out a SMS or email to participants a one click process. I just used it earlier today to save me a few minutes of frantic back-and-forth with my calendar and email when all I needed was to click once, and send auto-formatted SMS or email to say I was running late and bam! it was sent. When you just wanna type in a calendar event that gets added magically to Exchange or iCal. Now, the missing piece of the calendar puzzle is Microsoft Outlook on a Mac laptop, the bull in a china shop. Plus, it’s always a few clicks away to create a calendar event, moving away from your current application, getting to the calendar tab, opening an entry and awkwardly adding multiple details for an event, finding the right time before sending out. What if you could open up a calendar entry from a keyboard entry no matter where you’re at. The best part of this app is yet to come – natural language recognition, like Siri. So just hit – “Project meeting with Ed and John from 2 to 2:30 today at Boardroom” and it applies all the criteria to your calendar invite right from your Mac Menu bar. Love it. So much. And the fact that it adds a neat calendar to the Mac menu bar (which unfortunately lacks one) is the icing on the cake. Either way, the above 3 apps or maybe 2 (#2 and 3) finally provide a glass of refreshing ice water in a calendar hell. BTW, if you’ve any suggestions for similar Mac apps (desktop or iPhone), leave a comment.